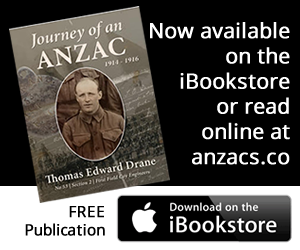 Thomas E Drane, left the town of Forbes, NSW, by rail on the 16th of August 1914, after reading that volunteers were needed for an Expeditionary Force to be formed in Sydney during WWI. During his service with the Australian army he compiled a personal diary of his wartime experiences. His diary illustrates the excitement and adventure that most volunteers would have experienced in the days of training leading up to battle. He writes of the time spent in Sydney with new friends and the cheering crowds when departing. And the times he enjoyed with mates, exploring Egypt’s natural wonders and culture while relieved from the rigours of wartime training. Then there is the harsh reality of the Gallipoli landing which has been so firmly entrenched in Australia’s history. To read in his own words the nightmare of the Gallipoli experience is to gain an insight into what many men had endured for the sake of their country. The stories contained in his diary are now more important than ever before. As the last of the men that served at Gallipoli join their fallen comrades, these stories will help future generations remember the sacrifices made by ordinary men. Extracts from the diary are published on this site. The full diary is available during the Anzac Day period only and is currently password protected. If you wish to request access to the complete diary please contact Andrew Drane.